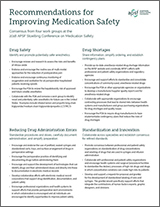 SUMMARY: The APSF 2018 Stoelting Conference on Medication Safety brought 150 attendees and 22 presenters together from different backgrounds and disciplines in order to discuss opportunities to reduce patient harm from perioperative medication use. Over two days, anesthesiologists, CRNAs, CAAs, pharmacists, nursing, critical care and pain management providers, academics, researchers, industry partners and foundation leaders broke out into work groups to examine the issues facing the industry and to recommend strategies for addressing these issues. The following list of recommendations are the result of the consensus work groups. Identify and promote safe anesthesia. Share information, simplify ordering, and establish contingency plans. 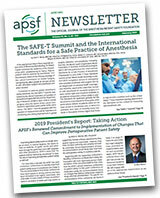 Provide up-to-date anesthesia-related drug shortage information on the APSF website and coordinate APSF’s efforts with professional and patient safety organizations and regulatory agencies. Standardize procedures and doses, carefully document administration, and simplify preparation. Collaborate across specialties and establish consensus for refined standards. Develop and support a request-for-proposal and grant(s) for the development of standardized labeling of vials and syringes. The grant(s) would specifically support efforts that integrate the contributions of human factors experts, graphic designers, and clinicians.